During IMSH 2018, HealthySim interviewed the team from Otosim to learn more about their new mobile product, which enables healthcare educators to simulate Otoscopy training easily with their own phone! 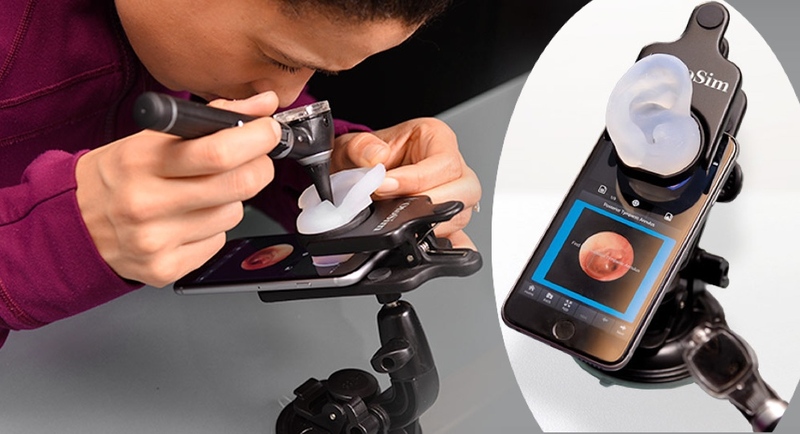 OtoSim Mobile transforms your smartphone into a hand-held otoscopy simulator delivering a complete cloud-based otologic curriculum. The new device is a complete otoscopy skills trainer, “on-the-go” which was developed by clinical otology educators with over 50 years of combined medical educational experience. We were impressed with how easy the device is to use seeing as almost every learner will have a smart phone! The OtoSim Mobile package includes a clip-on phone attachment, a Silicone Earform (right ear only), a functional otoscope for training purposes, a customized suction stand, a customized clamp stand, a leather travel bag, 1-year hardware warranty, and a 3-year software subscription. The system does require a smartphone with internet access to function which is not included in the package. OtoSim Inc. is a Toronto-based medical simulation company focused on otoscopy and ophthalmoscopy training with a goal is to enhance patient outcomes through better training of primary healthcare providers, with effective and innovative simulation tools. Their products include the OtoSim (otoscopy) and OphthoSim (ophthalmoscopy), which were developed in conjunction with key educators and clinicians from the University of Toronto and The Hospital for Sick Children (SickKids). Learn more and get yours on the Otosim Website!